Jaguar was really late to the game when it came to the lucrative SUV market. For Porsche it was the launch of the Cayenne back in 2002 that turned this company from a sports car company to an SUV company. And now with a 2nd model the Macan to to its line of cars, SUVs make now more 70% of Porsche’s sales. 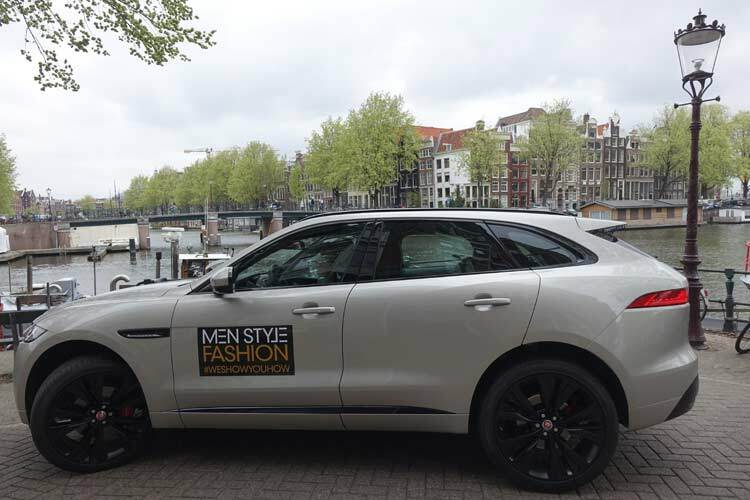 Last year Jaguar finally entered the SUV market with the F-Pace and MenStyleFashion was there for the UK launch where we reviewed the car. 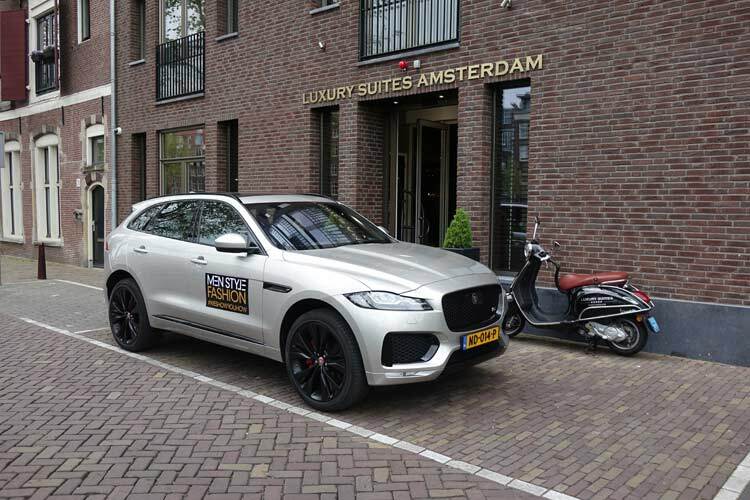 Almost a year later it is now time for a full review of the Jaguar F-Pace and it is the full spec model S that we take for a scenic tour through Holland and Germany. It was Easter holidays and it is the best time to visit my home country. I picked the F-Pace up from Jaguar Nederland and when seeing the car the first thing that stood out for me were the huge 22″ black wheels. This was a muscular looking car and I loved the bold design. The Model S badge on the back of the car and at the gave away that I was in the top spec F-Pace. With my luggage in the back of the huge boot it was time to take it for a drive. The short engine growl when starting the F-pace let me know it was present and the rotary automatic gear selector pops up ready for action. Small reminder on the steering wheel that I am driving the model S.
Driving in Holland is not like a car advertisement, no empty mountain roads to enjoy the best of your car. Here it is driving with speed controlled highways and secondary roads and lots of traffic jams. Almost every crossing is a roundabout and speed humps and other traffic calming measures are everywhere. There are city centres that make it hard for cars to enter. 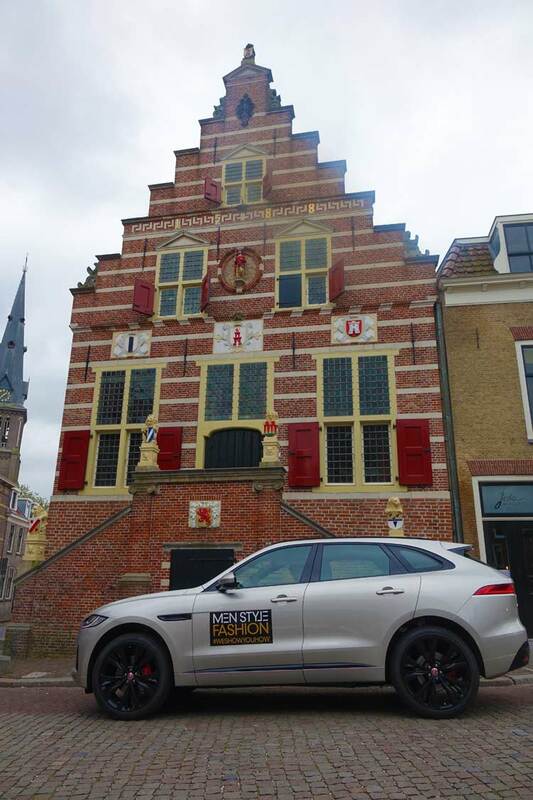 In the beautiful town of Oudewater I had to manoeuvre the F-Pace through two erected metal poles to enter the city centre. The city of Delft used cameras and licence plate tech to send me a warning I was not welcomed in the old town centre, next time I will be fined. All I wanted was to pose this beauty of a car with some typical Dutch scenery. So luckily most new cars and also the F-Pace have a lot of tech to warn you of speed cameras and the constant changing speed limits on the roads. 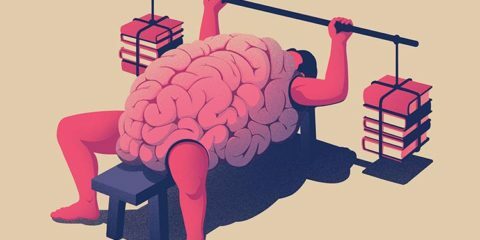 This helped me a lot staying within the legal limits. The adaptive cruise control is another one of those super inventions to make driving more relaxing. I did find you have to set it to the shortest distance possible, there are always cars trying to get even in the smallest spaces. With all this tech I was able to cruise even on the most busiest roads, keeping my eyes on the road with help of the heads up display. 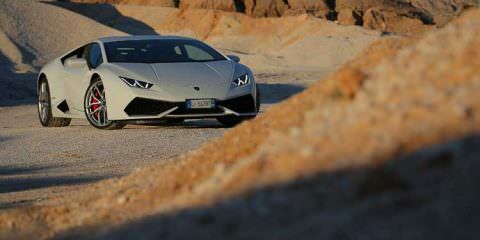 The 380 PS V6 supercharged petrol engine hummed quietly in the background, YEAH this car is an effortless cruiser. The F-Pace model S shows its different side when accelerating fast matching it with a beautiful loud growl to let everyone know it is there. Put it in sports mode and the revs will red line before switching gears. This F-pace is capable of doing 0-60 mph in 5.1 seconds, leaving most cars behind. 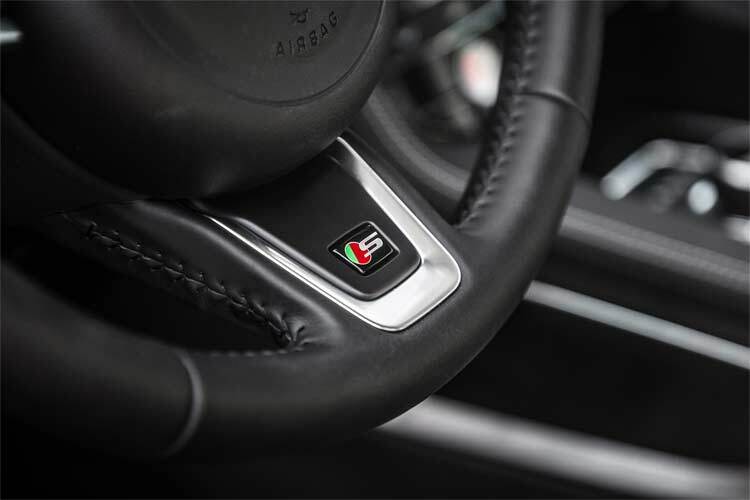 The F-Pace Model S is both a comfortable cruiser and a loud sports car in one. I remembered the smile from the Porsche Boxter driver when accelerating past his open car on the highway. The F-Pace is not the easiest car to park with its small rear visibility and a large turning circle. I was relying 100% on the rear vision camera and all the parking tech that comes with this car. 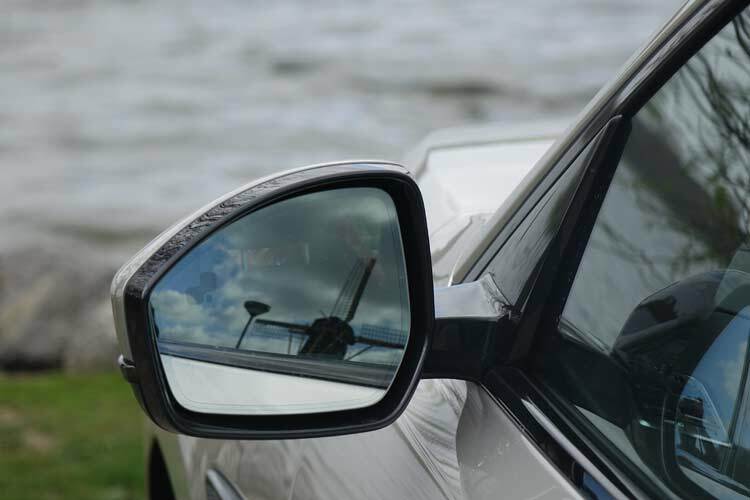 The blind spot warning systems were another great help to overcome the lack of visibility. What you do get in return is a car that looks great from the outside with a sloping rear window and a window line that goes up, making the F-pace stand out in the crowded SUV market. I took the F-Pace to Hollands largest city Rotterdam where I was in time for to see the Marathon. From there onwards I visited the governmental city of The Hague but I skipped the university town of Delft after not being welcomed in the city centre. 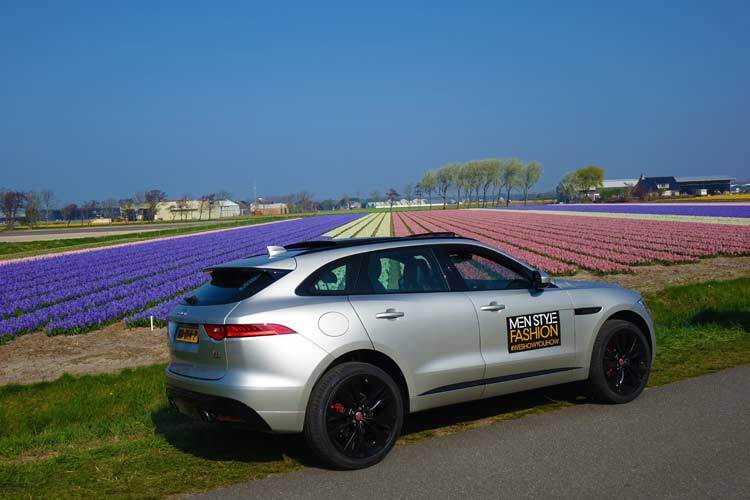 On the one and only sunny day during my stay I had to drive the F-Pace to see the amazing flower fields in bloom. Unfortunately I was not the only one here, it was packed with cars bumper to bumper. Of course a visit in Holland can not be without Amsterdam, with a special thanks to our friends at Luxury Suites Amsterdam for the 5 star accommodation. 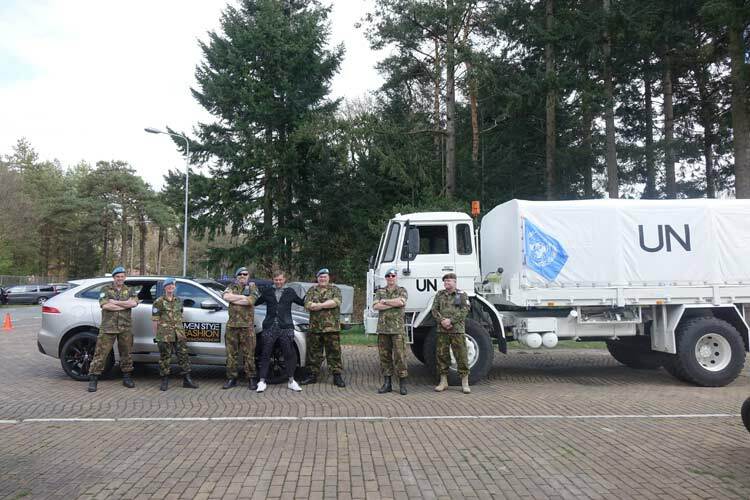 My last day in Holland was spend visiting a reunion of my old army transport battalion, here it was the battle of the 22″ wheels. Battle of the 22″ inch wheels. It was when I left Holland behind and took it to the autobahns of Germany that this F-pace model S came into its own. Finally there was acceleration beyond the 130 km/h speed limit. I felt there was good need for the F-Pace amazing breaking system. There were windy roads and hills this is what the F-Pace model S really needed, this is a driving SUV. With a full glass roof that can also be opened partially the F-Pace felt bright and roomy. 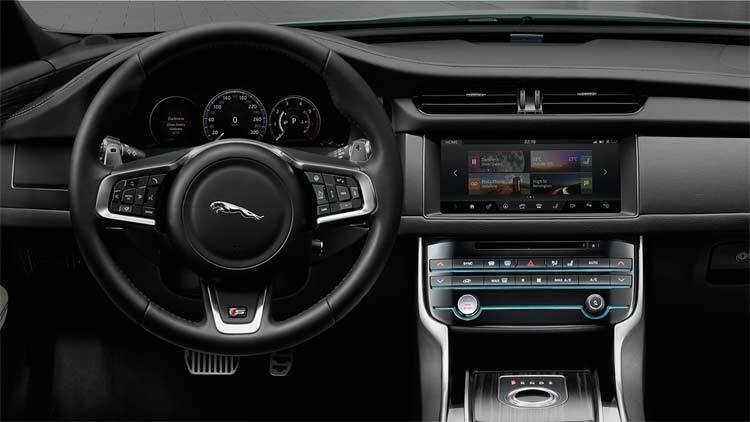 At the centre of the dashboard is the 10.2″ touchscreen which controls almost everything from navigation, rear cameras, phones, sound system control to the 10 different options of mood lighting. The top of the dashboard was leather and I loved the stitching of it which gave the F-Pace a real premium feel. The jaguar cockpit with two interactive displays and the pop up gear selector. In addition to the centre console there is the 12.3 virtual image display with four preset display feelings. Having the top spec model this one was kitted out with the the 11 speaker Meridian 380W Sound system which sounded amazing. That is not all for those that want more you can chose the 17 speaker 825 watt Meridian surround sound system. My car had an all leather black interior with the S logo embossed in the headrests of the all electric adjustable front seats. 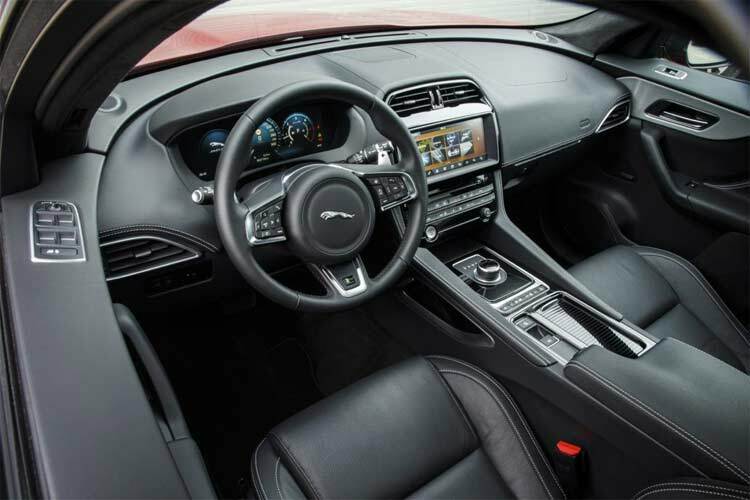 The whole interior felt premium like you expect from a brand like Jaguar. I had the F-Pace model S for 12 days and I really got attached to it, I was sad to let it go at the end. The F-Pace combines effortless driving with thrilling driving with a car exterior that stands out. For me it is the best looking SUV out there at the moment. Jaguar waited a long time to enter the SUV market but they got it spot on. 2016 sales show that the F-Pace is a huge success for Jaguar being its best selling car by a mile.